Join Peggy for this 7-month block of the month! Because the first offering of this beautiful block of the month quilt filled so quickly, we are offering a second "section", to accomodate more students who want to create this quilt. The pattern for each month will be free and there are fabric kits of Wilmington fabric! You will get the pattern at the beginning of each month's class, but you will know what the finished project looks like! 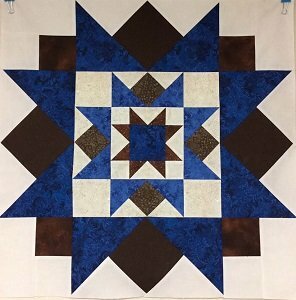 Click here for the Denim & Leather Stars Block of the Month supply sheet.